Besides the various lifts described in the previous chapters, there are many other varieties of lifts which are practiced more of less. In some localities, there is a vogue for lifting bar-bells while lying flat on the back. The lifter lies with the bell on the floor beyond his head. He reaches backward, grasps the handle of the bar-bell with both hands, lifts it across the face, and then raises it to arms' length, as in Fig. 105. Such a lift is more a test of arm strength than of bodily strength, but because the shoulders are supported by the floor, it is possible to push more weight to arms' length than when the athlete is standing erect on his feet. Also, when you're lying on your back, you push the bell in a different direction than you do when standing erect. When on the back, you practically push the bell in front of you, and the triceps muscles of the arms can exert more strength in pushing forward that they can in pushing upward. 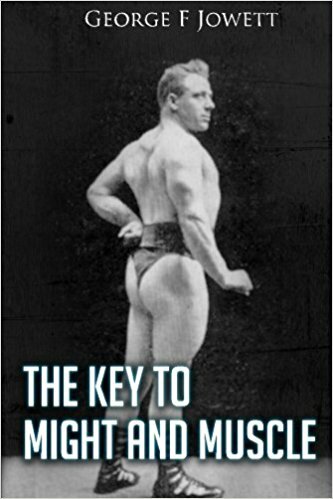 The record for a two-arm "pull-over" and "push" was held for many years by George Hackenschmidt, with 361 lbs. In making this record, he used a bar-bell with spherical ends, and each sphere measured 19 inches in diameter. 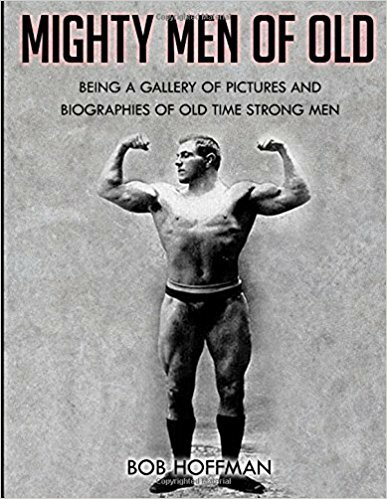 The spheres were so big that Hackenschmidt did not have to do much lifting to get the bell across his face to above his chest, because the handle was so high from the ground that all he had to do was to lean his face sideways. After he got the bell to the chest, he shoved it aloft easily by pure arm strength. On November 8, 1916, I saw this record broken by Joe Nordquest. 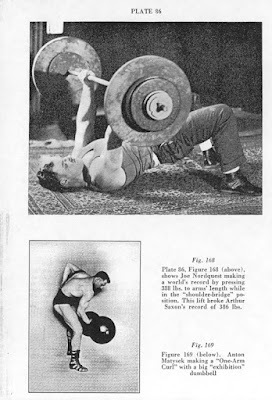 In order to put him on equal terms with Hackenschmidt, I made some iron plates 19 inches in diameter. The bell was first loaded to 300 lbs., and gradually increased until it weighed 363 1/2 lbs. At that weight Joe pushed the bell aloft without any great exertion. 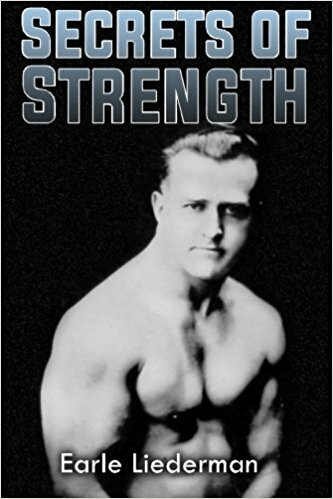 Arthur Saxton discovered that it was possible to push much harder with the arms if, instead of lying flat on the back, the body was arched in a shoulder bridge. 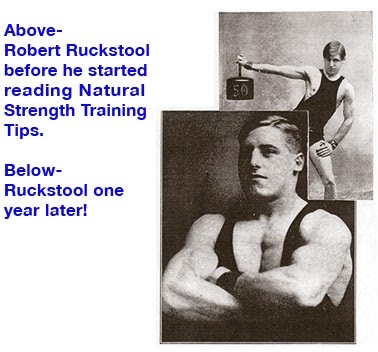 His record was 386 lbs., and Joe Nordquest broke it at my factory on February 17, 1917, by lifting 388 lbs. in the same style, which is shown in Fig. 168. There is still another style of lifting, known as the "body-toss," which is also performed while the athlete is lying on the floor. After he has pulled the bell across the face, he rolls it down the body until the handle rests right across his stomach. Then he bends his legs, places the soles of his feet on the floor, and raises his body in what we call the "shoulder bridge," that is, supported just by the shoulders and feet. To make the lift, he lowers the hips, and then quickly raises them and elevates the bell by a toss of the body and by a quick push of the arms. Lurich holds this record with about 420 lbs. The third lift in this class is known as the "wrestler's bridge" lift. 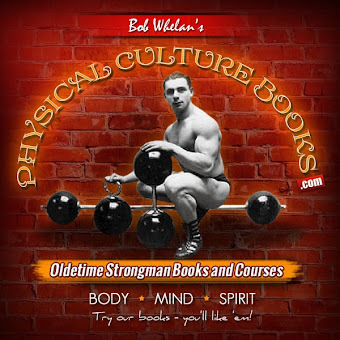 Before the lifter pulls the bell from the floor to chest, he arches his body into a "wrestler's bridge," bearing all his weight on the soles of his feet and the crown of his head. Then he pulls the bell over the face, and slowly presses it to arms' length, as in Fig. 106. Hackenschmidt holds this record with 320 lbs. This lift requires great strength in the back and the neck, as well as tremendous lifting and pushing power in the arm muscles. This lift can be converted into an attractive supporting feat. The hard work is pushing the bell to arms' length. After the arms are straightened, a great weight can be supported, either by the arms or on the body. Fig. 106 shows Owen Carr making a "wrestler's bridge" lift with 296 lbs., while Fig. 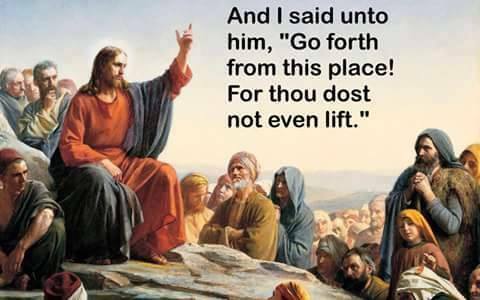 107 shows him supporting a total weight of 560 lbs. in the same position. 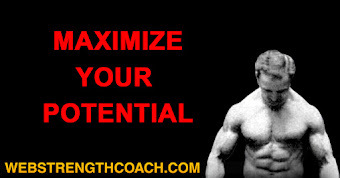 When I gave a list of developing exercises in the first part of the book, I did not include any for the neck. 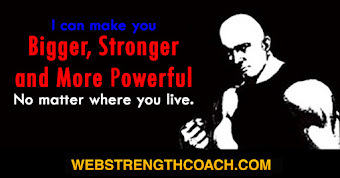 You can get all the special neck development you want by practicing lifting in the "wrestler's bridge" position, and it is not necessary for you to try to break any records. You can start with as low as 30 or 40 lbs., and by the time you have become able to pull a 100-lb. bell to the chest and then push it aloft six or eight times in succession, your neck will become as round and as well-shaped as you could possible desire. 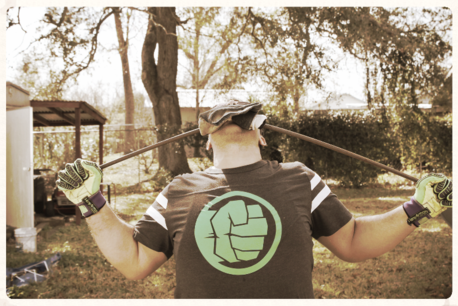 I have found that the neck increases in size and strength when using bar-bells, even if you do not take any special exercise for the neck itself. If a man starts out with a 36-inch chest and a 17-inch shoulder width, his neck will probably measure 14 1/4 inches. If, by practicing developing exercises, he increases the size of his chest to 42 inches, and his shoulder width to 20 inches, his neck will increase to 15 1/2 inches, or possible to 15 3/4 inches, at the same time, even if he has not done one exercise for the neck muscles. The size and shape of your neck is a barometer of your vitality; the face is the barometer of your condition. If your cheeks sag, it is a sign of poor condition, because that facial condition means that your body muscles are flabby. If your face is so thin that your cheeks are hollow, and if there are circle under your eyes, it means either that you are undernourished or overtrained. You can always tell a man's condition by looking at the contours of his face and the brightness of his eyes. In the same way you can tell the amount of vitality a man possesses by looking at the shape and size of his neck. If his neck is round as a column and shows no particular muscle, except under exertion, then he possesses a great amount of vitality. Any gain or loss in vitality is immediately revealed by an improvement, or the reverse, in the appearance of his neck. Great Endorsement from Ken Mannie!